Hi there! Thanks for stopping by. Be sure to sign up to follow me on bloglovin' to ensure you don't miss anything. As you may know, I love sewing clothes for my daughters, but any chance I get to sew something for myself gives me a whole 'nother level of satisfaction. Not only does this allow me to tailor the garment to fit my body perfectly, but most times, the cost is dramatically lower to make clothes myself. 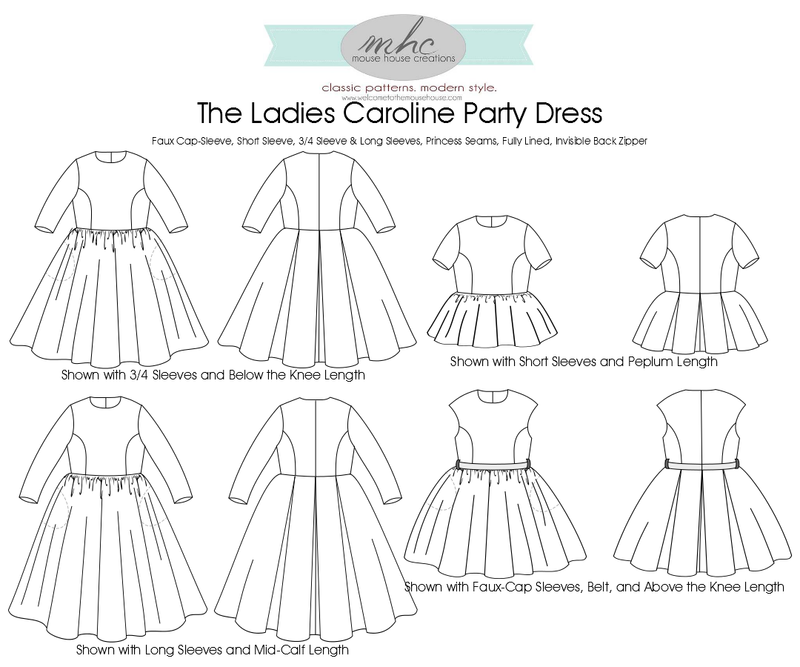 Hayley over at Mouse House Creations is about to release her newest pattern for women: The Ladies Caroline Party Dress and she has been kind enough to allow me to give away the pattern to one of you once it is released!! I (along with several other talented ladies) have been helping Hayley test this new pattern to ensure that it is perfect before it is released. Let me tell you, I LOVE this pattern. I've already completed 1 dress and have plans to make at least 5 more. Yes, 5! So, let's talk the details of this new pattern. It comes in sizes 0-22. It has 4 different hem lengths, 3 different sleeve lengths, options for pleated or gathered skirt, optional collar, optional belt loops and optional pockets! Just think of all of the different looks you can create from just one pattern. Have I convinced you yet that you NEED this pattern? Really, you do. So go ahead and enter the giveaway below. 1 lucky winner will be chosen on Thursday February 13th. Winner will be notified and emailed the pattern once it is released. Pattern is slated to be released after February 13th, but an exact release date has not been determined yet. Oooh, I love that glitter dot fabric!! So cute! It looks adorable on you, Lisa! So cute, I can't wait to make this! Looking Forward to this! SO cute! I would love to make a long sleeved dress that I could wear all the time! I love the one you made. That color is stunning! That sounds great! Thanks for stopping by! That is super cute! I can just see Mommy and Me outfits for me and my girls for Mother's Day this year! Thanks! Yes, that would be perfect! I have a problem with decisions...I would just have to make one of each! There are just so many options! So excited about this wonderful pattern! Thanks for entering! It really is a wonderful pattern! I would make the sleeveless version. It's so cute! I love the sleeveless version! If you shortened the bodice to empire waist it would work! that's what I'm planning :) I love the color of your dress, by the way! It's such a beautiful pink--my favourite! Thank you! I got lucky and found this fabric at the thrift store for $1! Was hesitant to use the pink for myself at first, but I love how it turned out. Faux cap sleeve, belt, and above the knee length! This is so pretty. Yours is gorgeous. Thank you! That sounds great! I love this! I would so make the sleeveless and then buy the girls version to make my daughter a matching dress! That will be so cute! I NEED this pattern. I love cute, momma friendly clothes! Yes, you do NEED it! Great pattern! I would definitely make a tea length with a peter pan collar. I love a good classic silhouette and they are so hard to find! love this! thanks for the giveaway! I really want to make this one! Maybe short sleeve for upcoming warm weather! I like the sleeveless version the best! I love it! I love the sleeveless version too! Knee length, half sleeves, with collar. Love this! I never make myself anything, but this would be fantastic! Thanks Sarah! You definitely need to make yourself something! Good luck! What a fun dress! I love it. I'd make a 3/4 sleeve peplum. Love this pattern and thanks for the giveaway! such a cute, but modest dress! The long sleeve option will definitely be my first one to make! It is very comfortable too! The long sleeve will be really cute. I love, love, love the pleated version. Just finished one up last night. I think I would make the cap sleeve version in knee length. Sounds like the perfect dress for me to make for my upcoming all girls vacation for when we go out. It is beautiful. Sounds like it will be perfect for you! It was so kind of you to stop by AND to leave a comment. Thanks! Can't wait to discover the winner of your giveaway. You're welcome! Thanks for entering the giveaway and good luck! I can't wait for this pattern! I love the short sleeves with below the knee length. The vintage-y silhouette is a great one for me! It really is a great pattern. You will love it! Crossing fingers it'll be out in time for your birthday! If not, it will be within days after. 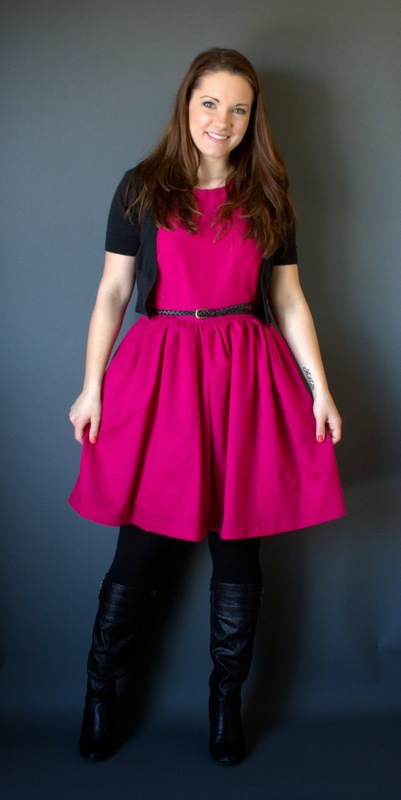 I want to make every version of this dress! I am so excited for this pattern. I've only asked Hayley three times when it was being released...I am making the 3/4 sleeves and knee length first! You will love this pattern! Peplum Length. I've been wanting a peplum. Making MYSELF anything is low on the list, so this would be a good excuse! The peplum version is so cute! Thank you! I just love this pink one as well. It actually only cost $3.50 in materials so that makes it even better! I loved the wide stripe dress version I saw. Seriously, I want to make each and every style shown in the pattern picture! But for starters, maybe the 3/4 inch sleeve, knee length version! Not sure if I want to go causal or more formal. If causal, a springy floral cotton. If formal, some black and white print..... :) Can't wait for its release! It is such a versatile pattern. You will love it! Cap sleeves knee length. Obsessed with this pattern! I'm obsessed with this pattern too! Just finished up my second Caroline last night. Sounds great! This pink one that I made is actually sleeveless due to an error on my part during testing, but it turned out great! Thank you! Yes, you do NEED this pattern! Cap sleeves Knee length :) I'm excited about this pattern!!! Seems very versatile. It is incredibly versatile. You will love it. I would make knee length with pockets and sleeveless too, so I can layer! I need to start with the faux cap sleeves and knee length. I feel like I have been waiting forever for this pattern. Yes, this release of this pattern has been highly anticipated by many! I'd make a sleeveless version of your dress. I love it and the color!! AWESOME!! Thank you so much for running this giveaway! Your dress is just as lovely as Hayley's pattern! Le sigh...just when I said no more patterns, I think I might need just one more...I'm really digging this dress. You did an awesome job! I just made that same version last night and it turned out so cute! I just love the pleats. I want to make a sleeveless version for hot Florida weather! It is a great pattern! Good luck! Me too! I can't wait to make them all! Short sleeve, above the knee belted version. So awesome! Faux cap sleeve, above the knee, pleated skirt! That's exactly what I made last night. I love it! I would love it to be knee length, with cap sleeves and no collar, pleated would be nice too. I love the pleated version! I have the little girls version and love it so I can't wait for the women's version! The women's version is just as great! You Look great on the project sewn sew along challenge. Awesome use of thrift store bargains. Thank you Liz!! I find some pretty great fabric at the thrift store. I love it. Love the pink!! I would start with the faux cap sleeve and pleated skirt, knee length. Thanks for the giveaway!! Make that below the knee, pleated, short sleeves. Faux cap, above the knee, pleated skirt (with pockets...and maybe a belt). I already have fabric in mind (Beauty Queen by JP), lol! I would like to make the sleeveless version first. I love the color of your dress. I would do the faux cap sleeve, above the knees version. I would also do it in a polka dot fabric to give it a retro vibe. I want to do one in polka dot too! I'd make the sleeveless version first. I adore the black and white stripe I've seen floating around. I love that one too! I really like the sleeveless version but also love the peplum top. Beautiful. Love the vintage style. I love the vintage style as well! Cannot wait to make this dress. Planning 3/4 sleeve and above the knee for my first. I've been obsessed with peplums lately so I would definitely start with that version! A dress for an upcoming wedding and then casual dresses for summer! This pattern looks awesome! I can't wait to sew on up! This pattern is great! I love it. Sounds great! Sewing big girl clothes is so rewarding! This is absolutely beautiful on you! ooh, that would be so pretty! I've made 2 so far and have plans for many more! I can't wait for this pattern! Probably above the knee and pleated with the faux cap sleeve. I am petite and have a hard time finding clothes that fit properly. I want to make one with cap sleeves! I would love to make the color-blocked version! SO gorgeous! I want to make a color-blocker version too! I would make a short sleeve below the knee version. I would make a sleeveless one - maybe try it out with a knit! I want to try it with knit too! I love the faux cap sleeves at the above the knee length. I would probably make the 3/4 or sleeveless dress version. SO amazing! Cap sleeve, above the knee. I've already got the fabric and everything!! Perfect! You will love it! I love this pattern!! It looks great on you! I might open a twitter account just to get another entry to win this pattern. I want it sooo bad. Faux cap sleeve, above the knee length, Ina black/ white wide stripe. I love the peplum top! Totally the top!!! So cute! Cap sleeve, above the knee.....something with an anchor print! I'd like to sew the peplum top, and then a dress. I'm thinking a casual one, sleeveless, knee length. Maybe in a classic black. This would be a perfect little black dress! Thank you!! I was so nervous to use it at first because of the bold color, but I love how it turned out. Cap sleeves, short with a belt!!! Copyright 2013. All rights reserved. This blog contains affiliate links. Simple theme. Powered by Blogger.